To mark International Women’s Day we spotlight the accomplishments of women in real estate and discuss gender in a field still characterized by inequity at its highest levels and in the commercial arena. Historically, there have been women in real estate almost since the industry’s inception in 1794 and its establishment as a legitimate business in the 1840s. The National Association of Realtors (NAR) has come a long way since its founding in 1908 when membership was entirely male. The first woman joined NAR in 1910, but women struggled for the next 40 years or so to serve on real estate boards. After being excluded from other real estate boards, female agents started their own Women’s Council of Realtors in 1938 as a parallel organization to NAR. Most real estate boards dropped gender restrictions by early 1950s, NAR reports. Today, the majority of Realtors—63 percent—are women, according to the NAR 2017 Member Profile. The typical real estate agent is a 53-year-old white woman who attended college and is a homeowner, according to NAR’s 2017 overview of the real estate market. Women may dominate the real estate industry—except in the lucrative commercial market—but they still don’t occupy as many executive-level positions as men, according to the Urban Land Institute’s 2015 survey of women in leadership. For instance, women make up 25 percent of the membership of the real estate and land use organization. But they only account for 14 percent of its CEOs, the survey found. “Women are much more likely to be at the helm of smaller organizations.” Some start their own businesses to create a workplace that reflects their values. Others find it easier to advance in smaller firms than larger ones, according to the study by the ULI’s Women’s Leadership Initiative. Only 12 percent of those surveyed are in president, CEO, executive director, or similar roles. And of the female CEOs, only 7 percent lead companies with more than 100 employees. Are you a woman looking for a career change? Download our FREE guide: Is a Real Estate Career Right for You? Tami Bonnell is one of the rare few who made it to the top. As CEO of Exit Realty, she oversees 30,000 agents and 600 offices. Bonnell credits her company for picking the best candidate for the job, regardless of gender. As a result, women make up 75 percent of the company’s top leaders—vice president and above—she said. Bonnell’s secret for success had a lot to do with timing. Her husband was able to stay at home with the couple’s three children when they were young. She waited until they were grown to take high-level positions that involved traveling. Many women who enter the field expect to earn a standard commission based on performance, not gender, she said. It is unfortunate pay inequity exists at the higher levels. Bonnell recalls being turned down for a position despite being better qualified because the male candidate had a family to support. She argued she had one too. “The industry has been pretty archaic for a long time. I think it’s getting easier,” she sums up. Her advice to women seeking advancement is to “keep aspiring to be better. Pay attention to opportunities even if you’re concerned there are others in the ring. It makes you stronger, better at negotiating. Go up the ladder. 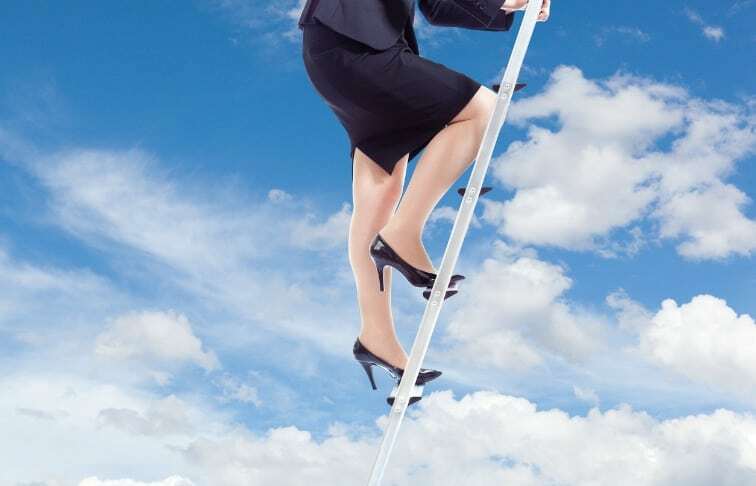 Don’t skip too many rungs.” Each step teaches how to handle increasing responsibilities and stress. She also encouraged mentorship, learning the ropes, and networking with those who have more experience. If women aren’t progressing it may be because men are better at standing up for themselves, she said. For instance, women should insist on being paid fairly by learning what others in similar positions earn. Another woman accustomed to shattering glass ceilings is Jo Ann Stevens of Lane Real Estate near Houston. Before leaving corporate America 30 years ago, she was chair of her Chamber of Commerce board, treasurer of an economic and development council committee, and national division head of a Fortune 1000 title company. “Women have to be knowledgeable on the subject they are discussing and conduct themselves in a professional manner to be considered a peer by their male colleagues,” says Stevens. Despite the challenges, being a woman in real estate today has its advantages, especially with female clients making most of the homebuying decisions, she said. Younger women who are newer to the industry are less likely than mid-career women to feel stifled by a glass ceiling, according to the ULI survey. More than half of female NAR members, 54 percent, are older than 60. In the commercial real estate world dominated by men, the more experience a woman has, the greater her level of job satisfaction, according to a 2015 benchmark study by the CREW (Commercial Real Estate Women) Network on the progress of women in the specialty market. Women in the field more than 20 years were happier than men with their career success and felt more fulfilled than ten years earlier, the report showed. The trend is surprising, considering that the gender wage gap widens with years of experience and the higher a woman ascends the corporate ladder. It may be one of the reasons women don’t aspire to C-level positions as much as men. Women are more likely to set their sights on senior vice president, the CREW Network reported. The 23 percent wage gap, largest in the brokerage and development specialties, has been shrinking in recent years. In 2015, the median total annual compensation in commercial real estate, including bonuses and profit-sharing, was $150,00 for men and $115,000 for women. Among the top barriers to success were the lack of a company mentor/sponsor, the lack of promotion opportunity, and gender discrimination, the CREW report found. Article by Roni Robbins. Roni Robbins is a 30-year journalist with business, environmental, and real estate specialties. She wrote real estate articles for Mother Nature Network, the Daily Report, and Atlanta Journal-Constitution. She also reported for the New York Daily News, WebMD, and Adweek with stories picked up by the Huffington Post, Forbes, USA Today, and CNN. Find out more about Roni here.